Too Dark To Barbecue - Not any more!! The Premium Products NEW DESIGN WATERPROOF & HEAT RESISTANT barbecue grill light with the solid metal C-Clamp will help you cook the perfect meal every time. 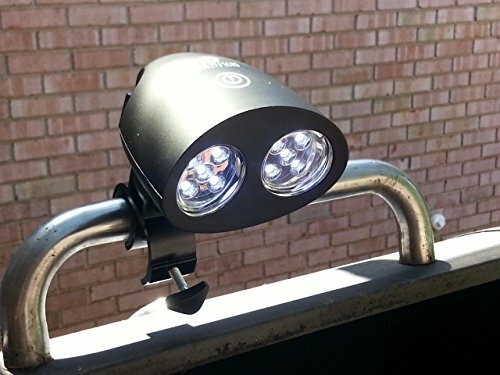 This super bright, 2 lighting level LED light is perfect for your outdoor grilling needs. The super easy design allows you to have this on your grill in seconds. The touch on/off switch operates easily without fumbling in the dark. The unique design also swivels on the horizontal 180 degrees and can rotate a full 360 degrees vertically providing top to bottom, side to side coverage of the largest cooking surface. 100% NO BS - NOW FULL 2 YEAR WARRANTY - Not happy with the product for any reason - No Problem we offer a Money Back guarantee for the first 60 days and back that up with a replacement guarantee. It's a simple NO RISK offer. If you have any problems, Premium Products will replace your light or give you your money back! DURABLE METAL C-CLAMP DESIGN: When others offer a plastic clamp, Premium Products Barbecue Grill Light comes with a solid metal clamp that will fit on most grill handles. The durable and heat resistant material withstands temperatures to 518 Degrees. This light is NOW WATERPROOF! TAKES SECONDS TO INSTALL & TOUCH ON & OFF OPERATION: The BBQ Grill Light is basically ready to use right out of the box. Takes 3 AA batteries (NOT INCLUDED) and the turn of the adjustable screw clamp that will attach to any gas grill or smoker with a width of approximately 1.5 Inches - Works perfectly for Big Green Egg Grills & Smokers!! MULTI-USE VERSATILE LIGHT IS EXTREMELY ENERGY EFFICIENT: This barbecue grill light can be used for a multitude of household purposes. Makes great camping lights, just attach to any tree limb for instant bright lighting. Attach to your bicycle handle bars for a safe and hard to miss ride at night. Keep one in the car for emergencies or to clamp to the hood when working on the motor. The three AA batteries last for over 15 hours of continued use, much longer if used as normal. 100% NO BS 2 YEAR WARRANTY - Not happy with the product for any reason - No Problem we offer a Money Back guarantee for the first 60 days and back that up with a replacement guarantee. It's a simple NO RISK offer. If you have any problems, Premium Products will replace your light or give you your money back! If you have any questions about this product by Premium Products LED Grill Light, contact us by completing and submitting the form below. If you are looking for a specif part number, please include it with your message.